We are excited by the reviews that Windows 7 is receiving and the great benefits this will bring to our customers. We've been trying it out ourselves and the stability and integrated Office Suite features it brings are exciting. This article sums up the software nicely. In just two weeks, on Oct. 22, Microsoft's long operating-system nightmare will be over. The company will release Windows 7, a faster and much better operating system than the little-loved Windows Vista, which did a lot to harm both the company's reputation, and the productivity and blood pressure of its users. PC makers will rush to flood physical and online stores with new computers pre-loaded with Windows 7, and to offer the software to Vista owners who wish to upgrade. WSJ's Personal Technology columnist Walt Mossberg reviews Windows 7, the successor to one of the least successful versions of Microsoft's operating system, Windows Vista. With Windows 7, PC users will at last have a strong, modern successor to the sturdy and familiar, but aged, Windows XP, which is still the most popular version of Windows, despite having come out in 2001. In the high-tech world, an eight-year-old operating system is the equivalent of a 20-year-old car. While XP works well for many people, it is relatively weak in areas such as security, networking and other features more important today than when XP was designed around 1999. Discuss: Will you upgrade to Windows 7? After using pre-release versions of Windows 7 for nine months, and intensively testing the final version for the past month on many different machines, I believe it is the best version of Windows Microsoft has produced. It's a boost to productivity and a pleasure to use. Despite a few drawbacks, I can heartily recommend Windows 7 to mainstream consumers. Like the new Snow Leopard operating system released in August by Microsoft's archrival, Apple, Windows 7 is much more of an evolutionary than a revolutionary product. Its main goal was to fix the flaws in Vista and to finally give Microsoft customers a reason to move up from XP. But Windows 7 is packed with features and tweaks that make using your computer an easier and more satisfying experience. The new taskbar shows small previews of many windows and allows for larger previews. Walt answers readers' question on buying Windows 7, good alternatives to Quicken, and more. Windows 7 introduces real advances in organizing your programs and files, arranging your taskbar and desktop, and quickly viewing and launching the page or document you want, when you want it. It also has cool built-in touch-screen features. It removes a lot of clutter. And it mostly banishes Vista's main flaws—sluggishness; incompatibility with third-party software and hardware; heavy hardware requirements; and constant, annoying security warnings. I tested Windows 7 on 11 different computers, ranging from tiny netbooks to standard laptops to a couple of big desktops. These included machines from Lenovo, Hewlett-Packard, Dell, Acer, Asus, Toshiba and Sony. I even successfully ran it on an Apple Macintosh laptop. On some of these machines, Windows 7 was pre-loaded. On others, I had to upgrade from an earlier version of Windows. In most cases, the installation took 45 minutes or less, and the new operating system worked snappily and well. But, I did encounter some drawbacks and problems. On a couple of these machines, glacial start-up and reboot times reminded me of Vista. And, on a couple of others, after upgrading, key features like the display or touchpad didn't work properly. Also, Windows 7 still requires add-on security software that has to be frequently updated. It's tedious and painful to upgrade an existing computer from XP to 7, and the variety of editions in which Windows 7 is offered is confusing. Finally, Microsoft has stripped Windows 7 of familiar built-in applications, such as email, photo organizing, address book, calendar and video-editing programs. These can be downloaded free of charge, but they no longer come with the operating system, though some PC makers may choose to pre-load them. In recent years, I, like many other reviewers, have argued that Apple's Mac OS X operating system is much better than Windows. That's no longer true. I still give the Mac OS a slight edge because it has a much easier and cheaper upgrade path; more built-in software programs; and far less vulnerability to viruses and other malicious software, which are overwhelmingly built to run on Windows. Now, however, it's much more of a toss-up between the two rivals. Windows 7 beats the Mac OS in some areas, such as better previews and navigation right from the taskbar, easier organization of open windows on the desktopand touch-screen capabilities. So Apple will have to scramble now that the gift of aflawed Vista has been replaced with a reliable, elegant version of Windows. Here are some of the key features of Windows 7. 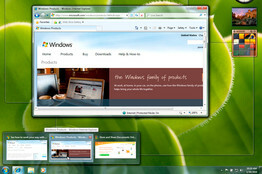 New Taskbar: In Windows 7, the familiar taskbar has been reinvented and made taller. Instead of mainly being a place where icons of open windows temporarily appear, it now is a place where you can permanently "pin" the icons of frequently used programs anywhere along its length, and in any arrangement you choose. This is a concept borrowed from Apple's similar feature, the Dock. But Windows 7 takes the concept further. For each running program, hovering over its taskbar icon pops up a small preview screen showing a mini-view of that program. This preview idea was in Vista. But, in Windows 7, it has been expanded in several ways. Now, every open window in that program is included separately in the preview. If you mouse over a window in the preview screen, it appears at full size on your desktop and all other windows on the desktop become transparent—part of a feature called Aero Peek. Click on the window and it comes up, ready for use. You can even close windows from these previews, or play media in them. I found this feature more natural and versatile than a similar feature in Snow Leopard called Dock Expose. 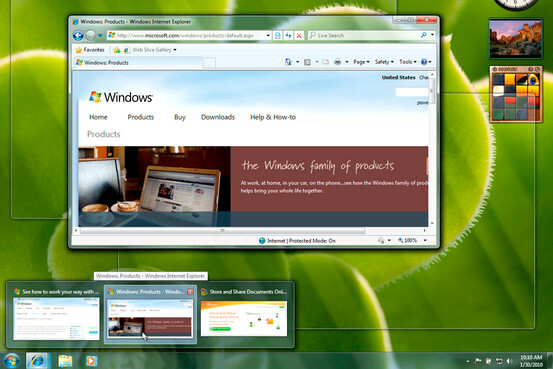 You can also use Aero Peek at any time to see your empty desktop, with open windows reduced to virtual panes of glass. 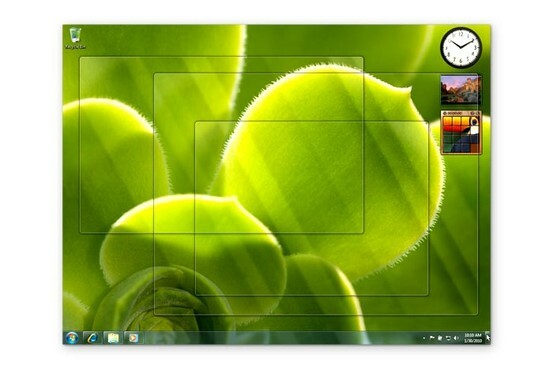 To do this, you just hover over a small rectangle at the right edge of the taskbar. Taskbar icons also provide Jump Lists—pop-up menus listing frequent actions or recent files used. Desktop organization: A feature called Snap allows you to expand windows to full-screen size by just dragging them to the top of the screen, or to half-screen size by dragging them to the left or right edges of the screen. Another called Shake allows you to make all other windows but the one you're working on disappear by simply grabbing its title bar with the mouse and shaking it several times. File organization: In Windows Explorer, the left-hand column now includes a feature called Libraries. Each library—Documents, Music, Pictures and Videos—consolidates all files of those types regardless of which folder, or even which hard disk, they live in. Networking: Windows 7 still isn't quite as natural at networking as I find the Mac to be, but it's better than Vista. For instance, now you can see all available wireless networks by justclicking on an icon in the taskbar. A new feature called HomeGroups is supposed to let you share files more easily among Windows 7 PCs on your home network. In my tests, it worked, but not consistently, and it required typing in long, arcane passwords. Touch: Some of the same kinds of multitouch gestures made popular on the iPhone are now built into Windows 7. But these features won't likely become popular for a while because to get the most out of them, a computer needs a special type of touch screen that goes beyond most of the ones existing now. I tested this on one such laptop, a Lenovo, and was able to move windows around, to resize and flip through photos, and more. Speed: In my tests, on every machine, Windows 7 ran swiftly and with far fewer of the delays typical in running Vista. All the laptops I tested resumed from sleep quickly and properly, unlike in Vista. Start-up and restart times were also improved. I chose six Windows 7 laptops from different makers to compare with a new MacBook Pro laptop. The Mac still started and restarted faster than most of the Windows 7 PCs. But the speed gap has narrowed considerably, and one of the Lenovos beat the Mac in restart time. Nagging: In the name of security, Vista put up nagging warnings about a wide variety of tasks, driving people crazy. In Windows 7, you can now set this system so it nags you only when things are happening that you consider really worth the nag. Also, Microsoft has consolidated most of the alerts from the lower-right system tray into one icon, and they seemed less frequent. Compatibility: I tried a wide variety of third-party software and all worked fine on every Windows 7 machine. These included Mozilla Firefox; Adobe Reader; Google's Picasa and Chrome; and Apple's iTunes and Safari. I also tested several hardware devices, and, unlike Vista, Windows 7 handled all but one smoothly. These included a networked H-P printer, a Canon camera, an iPod nano, and at least five external flash drives and hard disks. The one failure was a Verizon USB cellular modem. Microsoft says you don't need external software to run these, but I found it was necessary, and even then had to use a trick I found on the Web to get it to work. If you have a standard PC, called a 32-bit PC, you'll need at least one gigabyte of memory, 16 gigabytes of free hard-disk space and a graphics system that can support Microsoft technologies called "DirectX 9 with WDDM 1.0." You'll also need a processor with a speed of at least one gigahertz. If you have a newer-style 64-bit PC, which can use more memory, you'll need at least two gigabytes of memory and 20 gigabytes of free hard disk space. In either case, you should double the minimum memory specification. Aero Peek lets you see your desktop by making your windows transparent. Installation, editions and price: There are four editions of Windows 7 of interest to consumers. One, a limited version called Starter, comes pre-loaded on netbooks. A second, called Business, is mainly for people who need to tap remotely into company networks (check with your company to see if you need this). A third, called Ultimate, is mainly for techies who want every feature of all other editions. Most average consumers will want Home Premium, which costs $120 for upgrades. Unfortunately, XP owners, the biggest body of Windows users, won't be able to do that. They'll have to wipe out their hard disks after backing up their files elsewhere, then install Windows 7, then restore their personal files, then re-install all their programs from the original CDs or downloaded installer files. Then, they have to install all the patches and upgrades to those programs from over the years. Microsoft includes an Easy Transfer wizard to help with this, but it moves only personal files, not programs. This painful XP upgrade process is one of the worst things about Windows 7 and will likely drive many XP owners to either stick with what they've got or wait and buy a new one. In my tests, both types of installations went OK, though the latter could take a long time. Bottom line: Windows 7 is a very good, versatile operating system that should help Microsoft bury the memory of Vista and make PC users happy.